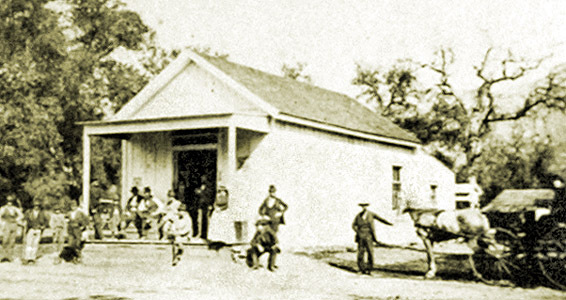 The first general store in Ojai Valley was opened by Mr. and Mrs. L.R. Herbert in 1874 on the north side of Ojai Avenue across from the present Civic Center Park [now, Libbey Park]. Ojai pioneers recall it as a small one-story building with one room that carried everything the early settlers needed. The Nordhoff store, as with most general stores, had a little section in the front for the distribution of mail. This addition, of course, drew many into the store who, in winter especially, lingered around the wood-burning stove in the middle of the room. Here the cracker-barrel philosophers settled the problems of the world, lent their ears for local news and gossip. Early settlers remember the blending aroma of cheese, coffee, spices, sausages and new leather. Of course, nothing was packaged, and the storekeeper measured the amount wanted from barrels, sacks and other volume containers. Farmers, with their wagons hauling hams, chickens in small coops or with legs tied, cases or boxes of eggs, tied their horses to hitching racks or trees and proceeded to trade their produce for coal oil, flour, sugar, harness and other needs. Barter between the farmer and the storekeeper was the general rule. This put an extra load on the Nordhoff storekeeper, who had to take all the farm produce to Ventura and bring back goods for sale. With dusty roads in summer and deep mud in winter, this was quite a burden for heavy-laden wagons. Through the years the little store was sold to A.A. Garland and son. Later, Thomas Gilbert bought it. Finding that he needed help in the store, he sent for his bride-to-be from Michigan and announced publicly that he was going to be married. He invited all the residents of the valley to the wedding, which was held on the hotel grounds [at the front of what is now Libbey Park] with music furnished by the Ventura band. Some years later, the Thomas Gilbert family moved to Santa Barbara. A Mr. Brown and his wife then took over the store for a brief period, but Frank P. Barrows bought it and changed it to a hardware store. Finally, Mr. G.H. Hickey and two brothers bought it and rebuilt it. The Rains Department Store, now operating on the same site, is a successor to Hickey Brothers and is operated by Alan Rains, grandson of Mr. G.H. Hickey. I’ve lived in Ojai my entire life. When I was a little boy, my maternal grandmother (Margaret “Peg” Wells) worked at the “Hickey Bros.” store. When the Hickey brothers sold the store to Lynn Rains (Alan’s father), she began working for Mr. Rains. This was back in the days when a breezeway ran between the clothing store of “Rains Department Store” and it’s hardware store. People could use this breezeway to walk from the front of the Arcade to the market that used to occupy the building that is now “Rainbow Bridge Natural Food Store”. By the way, outside of that market was a Coca-Cola soda-pop vending machine. To my knowledge, it was the last vending machine in the Ojai Valley to sell bottles of pop for only a nickel. All of us kids knew where it was located! If you go on top of the Arcade, you can still see the old storefront.